In the past we were always told to worry about strong winds when spraying. We now know that low wind conditions can be as bad or worse. New and reviewed herbicide labels since 2008 state that you must not spray during a surface temperature inversion. What is a surface temperature inversion? At sunset the ground loses heat and under low wind conditions air close to the ground cools while air above it is warmer. The air doesn’t mix and is described as being stable. Air temperature increases with height compared with during the day when air temperature most often decreases with height. When this occurs close to the ground it is called a surface temperature inversion. In a surface temperature inversion the point where the temperature stops increasing and begins to decrease is the top of the inversion layer. This is usually the top level of suspended particles such as dust, smoke and small spray droplets or vapour. Note that these inversions can act as a barrier to regional winds which go over the top of the inversion preventing mixing of the air. This means that inversions can co-exist with higher wind speeds such as greater than 20 kph. What is the big deal with surface temperature inversions? In November-December 2015 large areas of sensitive crops in NSW and Queensland have been damaged by spray drift, largely through spraying during inversion conditions. See the APVMA press release http://apvma.gov.au/node/19546 saying they won’t take action at this point. Hmm. Because inversions prevent the mixing of air, any suspended fine droplets and particles, including spray, can move off in any direction to be deposited up to 20 km away once the inversion breaks the next day. Cold air drainage within the inversion will cause fine droplets and particles to accumulate in the low parts of the landscape. Remember that spray drift creates a number of major issues including crop damage, damage to sensitive vegetation and contamination of water and produce. Have you signed a declaration saying that you haven’t applied certain chemicals? You might not have, however contamination could have occurred via drift and you could be paying the price through rejection of your product. A reduction in wind speed to below 11 kph is necessary for all seasons. 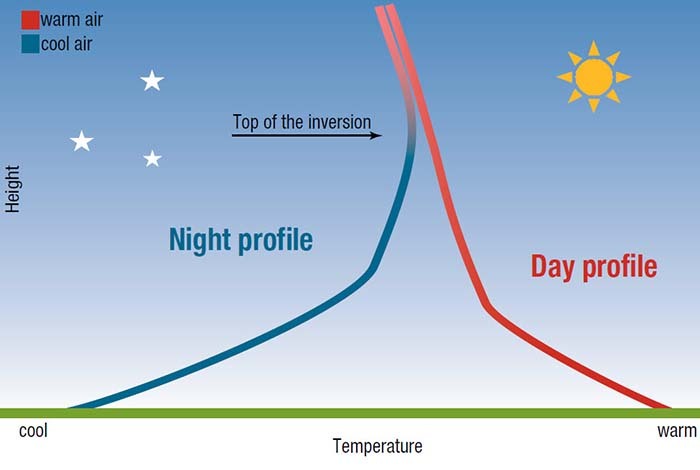 In summer, a fall of at least 4°C from maximum temperature recorded on the day promotes an inversion an hour after sunset. In winter, a fall of at least 2°C from the maximum temperature recorded on the day promote an inversion even an hour before sunset. If the difference between the observed maximum temperature and forecast minimum temperature is 10°C or more then there is a 90% risk of inversion conditions at sunrise. Research funded by the GRDC is currently being conducted by Graeme Tepper and Warwick Grace to predict the formation of surface temperature inversions and assign risks for night spraying. The research is well advanced in Western Australia and will be continued in more complex terrain (i.e. not WA) over the next 12 months. Yes, WA is pretty flat. Nufarm Spraywise Decisions™ and Syngenta’s Weather forecast are tools you should all be using for planning your spray program. Most broadacre growers want the capacity to spray their whole farm within about a ten day period or less if possible. Generally the first way to get more spraying done in a limited time period is to spray at night. The widespread adoption of auto-steer and tram-tracking has meant that spraying at night is easier to do, thus giving more hours spraying per day. Night spraying has also been promoted as giving better weed control because it is cooler with higher humidity so target weeds will be less stressed. This however is not always the case and anyone looking at meteorological data over a 24 hour period in summer will see that meteorological conditions may not necessarily differ much between night and day. There is a lot of preparation for successful, low risk night spraying. Image:AGRONOMOThis first article on night spraying discusses the issues encountered if there isn’t a surface temperature inversion. The second part will discuss surface temperature inversions and why they are bad news for spraying. No inversion, so you think you are covering the bases? Despite trying to do all the right things such as using a coarser droplet spectrum with matching application volume and keeping within the ground speed limits of your sprayer significant drift can occur with night spraying. Night spraying can deposit 5 times the amout of spray into the air compared with spraying diring daylight hours. To demonstrate what can happen I will discuss research conducted by Bill Gordon Consulting in northern NSW comparing drift from night versus day spraying. A 55 ha paddock was sprayed at 2:30 am and again at 7:30 am using a 36 m boom travelling at 22 kph, with Teejet AIXR 11002 nozzles, 50 L/ha at 4 bar producing a coarse spray quality. Herbicide drift was measured 80 m downwind of the paddock using a 20 m high collection tower. The experiment showed that less than 0.5% of total spray applied to the paddock was collected at the tower during the daylight application compared with 1.5% from the night application. This means there was virtually one hectare’s worth of spray heading downwind from the sprayed paddock at night despite the “acceptable” spray conditions. Looking at the meteorological data below there was little difference between the two application times. Despite there being no surface temperature inversion there was still 3 times the spray in the air moving downwind at night. Higher daytime wind speed would have created more mixing of the air and forced droplets down to the target compared with night spraying. The other thing to consider is it isn’t just what you do, but the cumulative effects of other sprayers in the local area. Often neighbours will be spraying at night launching small amounts of spray into the air which can accumulate in downwind areas of the landscape and becomes a much bigger problem to sensitive vegetation in those areas. How to reduce the problems with night spraying? DO NOT spray during a surface temperature inversion. Keep measuring meteorological conditions during spraying and stop spraying if conditions deteriorate. Have a pre-determined cut-off for when you will stop. Use extremely coarse (XC) spray quality – in this experiment XC spray quality would have reduced drift to 0.5% for the same conditions. Keep in mind the suitability of these coarse droplets on the target and the product to be used and the need to go to increase application volume as spray quality becomes coarser. Slow down and keep boom height to a minimum – higher speeds increase the volume of finer droplets being lifted behind the machine creating a plume of spray lifting 15 to 20 m into the air. Higher speeds usually means lifting the boom. Lifting boom height from 50 to 70 cm above the target increases drift potential 4 times while going from 50 to 100 cm increases it 10 times. Only spray paddocks with good catch surfaces, such as stubble or dense vegetation. Make sure you know if there are sensitive areas downwind. The next blog will explain surface temperature inversions and why most labels state that you are not to spray if an inversion has formed.